Thanks to Greg Pincus from Gottabook who set me straight on downloading the Microsoft Silverlight plug in ( I had worried it would conflict with my Mac), I was able to enter the online world of Shidonni. 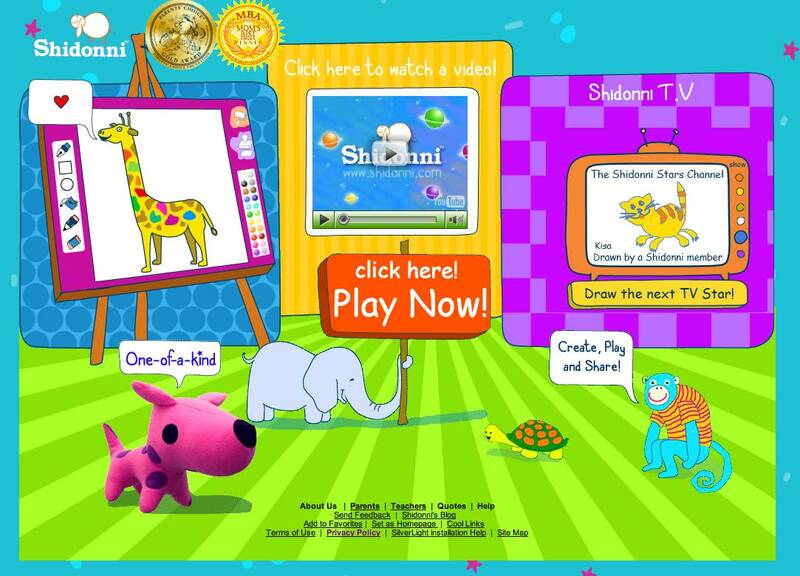 In Shidonni, kids get their own online "pen and paper" to sketch animals. The moment they do, their creations come to life ‘virtually’. Kids can then create worlds for their animals, feed them, play with them and share them with their friends. Shidonni is ideal for kids aged 4-12 years old, but anyone can play. This is why we have added many layers of safety and privacy. We monitor any creation that is being shared globally and at this point, we are not allowing any type of chat or messaging. Once you register, you log in and navigate straight to a screen where you draw your favourite animal, draw food for him, feed him and draw a background for him. The animal you draw "comes to life". Then you are invited to choose a game to play. I was disappointed to find that most of the tools I chose to draw with were only available if I had Shidonni Pro. Once I tried to choose a game, I somehow got to a screen that offered me a toy to buy for $79.99! This was called One of a Kind. Other games were better, and involved the animal I'd made. There's a real social element to Shidonni. Kids can play against their friends and swap animals with others. Shidonni Pro costs $5.95/month, or $24.95 for six months. The great thing is, there are still lots of free activities so you and your child can decide if you think Shidonni warrants paying. I have heard many people give good reviews of Shidonni, and it has won Parents Choice awards etc. I prefer Poisson Rouge and Boowa and Kwala for young kids. I didn't really picture 10-12 year-olds getting into this site, but Kelly Tenkely's review says her students love it. She also has some great suggestions for using the site. I guess it's all a matter of personal preference. Why not check out their page for parents, get the free trial and see what you think? I will say it again, my students absolutely love using this site to create. They would spend hours on it if they could. It is such a fun way for them to be creative and bring their creations to life. I'm glad I read your review, Kelly, and gave Shidonni a chance!